Patterson Pope is a leading commercial high density storage solutions partner for businesses in the Tampa, Florida region. We offer a wide range of shelving (static, rotary, high-density, etc. ), Modular Casework, Cabinets (stainless steel, laminate, etc. ), Lockers (evidence, weapons, etc.) and much more. 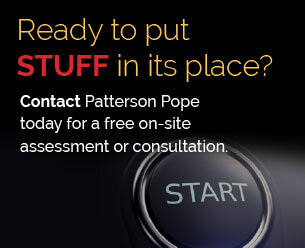 Complete our Information Request Form or visit the Contact Us page to learn more about Patterson Pope’s mobile shelving and high density storage solutions in Tampa. Due to the wide range of the industries we serve, we have a large variety of high density storage solutions. It would be impossible to have a single product that would meet the needs of an industrial warehouse as well as that of a museum. For the past 40 years, we have been designing our storage products with the specific needs of all industries in mind. Feel free to browse our site, and you will see that we have thought of everything – from wide-span shelving for museums to automated retrieval systems for large industrial warehouses. As you can see, the options are nearly endless. Our products page will guide you through the options for each of our products. Our High-Density Shelving solves all sorts of space problems and includes a long list of variations. In addition, our Lockers come in all different shapes and sizes yet all offer the high level of security that ensures the safe storage of valuable items. Our team of high density storage and mobile shelving experts proudly service the greater Tampa area, including Clearwater, St. Petersburg, Bradenton, Lakeland, New Tampa, Palm Harbor, and other surrounding areas.